My very good friend June asked me to make her some monogrammed cards with the first initial of her last name. 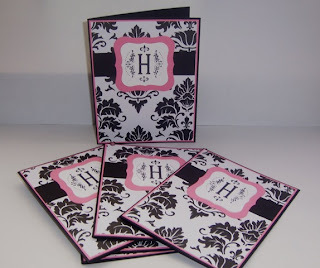 I used my new JustRite Damask borders set for her cards. This is my first set from JustRite and I REALLY love the product. I'll probably be ordering some more JustRite products in the near future. The only request June had for her cards was that I use a little bit of pink somewhere. I hope it's not too much pink, at least I don't think it's too much pink. I'm sure she's going to love them. I used some designer paper from GCD studios called Simpicite from the Cosette Collection. I really like this paper!! I'm glad I ordered 2 sheets I might have to make some for myself. Absolutley Love how those turned out! I have the same set from Just rite & I am making some for my niece who is getting marreied next weekend. I may almost copy you! I love these!!! That little pop of pink is great. They came out very pretty Felecia. They look so elegant. How very exquisite...she will love them. So pretty! Love the color combo! These are so elegant. Love the look of that pretty PP and how a little pink is added. Very classy! So pretty. Love th color combination. It is so classy! Stunning work! I love it and they are perfect! Felicia, Those cards are gorgeous. I've been thinking about getting some Just Rite products. Can't seem to make up my mind what I want first. Thanks for the inspiration! Girl these are beautiful, love the colors you chose for these. These are so pretty! Wow, she will love them! This is the PERFECT amount of pink to accent the b/w! Pretty pretty...do you think she'll actually use them? I know I would hoard them forever. haha!! Lovely - these look so elegant. Wow! I am in LOVE with these monogrammed cards, Felicia! The colors are just yummy and the layout is gorgeous!! Whoever the lucky person is to get these is going to LOVE them!! Have a great weekend and a Happy Valentines Day! Lovely cards. I really like the black, white and pink colors together. You are a very nice friend. These are awesome! I am so ordering this paper!!! Hi felicia! hope all is well with you. I wanted to stop by and wish you a Happy Valentines Day. These cards are so pretty! These are stunning! I love the pink on them! Absolutely beautiful Felicia. Just beautiful. I love the Just Rite Stamper. I just need some of the new borders - these cards turned out stunning. These are lovely. Great design. These are sooo pretty!! I love the color combo! This is beautiful. Love the paper you chose. The colors just pop!